Tirpitz Raider personal 1944 617 sqn WW2 memorabilia. Warrant Officer Harry Johnson DFM, 57 & 617 Sqn mementos from Yagodnik 1944, from where 617 sqn launched the Tirpitz raids. 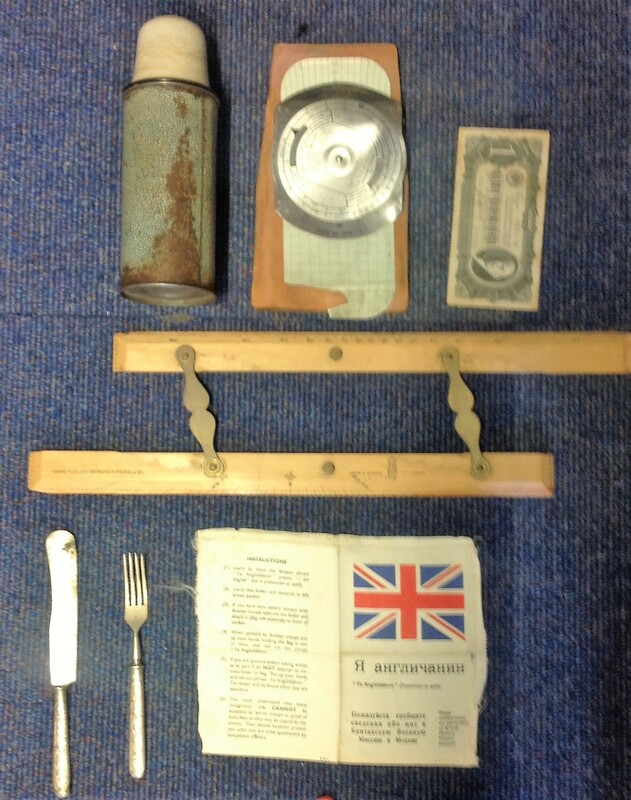 Includes Russian Knife and Fork, his personal flask carried on sorties, One rouble note signed by Russian waitress, silk printed Russian survival document if shot down over Russia, his parallel ruler, and US navigation instrument recovered from a crash. He flew all three Tirpitz raids and many Flights in the Berlin Airlift. DFC awarded 19/5/1944. Tirpitz had been moved into a fjord in northern Norway where she threatened the Arctic convoys and was too far north to be attacked by air from the UK. She had already been damaged by an attack by Royal Navy midget submarines and a series of attacks from carrier-borne aircraft of the Fleet Air Arm, but both attacks had failed to sink her. The task was given to No. 9 and No. 617 Squadrons where they were deployed to Yagodnik, near Archangel a staging base in Russia to attack Tirpitz with Tallboy bombs. From Jim Shortland 617 Sqn Historians personal collection. Johnson was a navigator He flew all three Tirpitz raids, Saumur Railway raid and 97 flights in the Berlin Airlift. Good Condition. All signed pieces come with a Certificate of Authenticity. We combine postage on multiple winning lots and can ship worldwide. UK postage from £3.99, EU from £5.99, Rest of World from £7.99.